In “Artifacts: 40 Poems,” the major portion of this book, the ground is never steady. There is the sense at every moment that the poet’s attention may turn, to incorporate the unexpected detail, the wayward reflection, and thus transform our reading of the whole. By drawing on a variety of poetic techniques, Weiss grants none sovereignty: discernible in the mix are an Objectivist-like precision for registering the external world, a receptivity to chance events, occasional intimate confessions, nuanced repetitions, even snippets of nature poetry. Rather, these are works of assemblage, of delicate tensions and juxtapositions, the disparate parts ringing sympathetically. and the ghosts of trees on the Palisades. Driving across the shadows of bare branches. Through the shadows of bare branches. All these things that should never have happened. 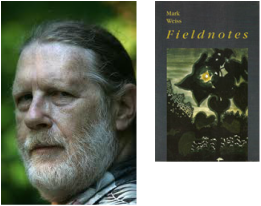 Fieldnotes is Weiss’s first book of poems in nineteen years. Where the ‘artifacts’ are spare and composed, the two long poems that precede them sprawl with an impassioned notetaking, as so many fragments arranged in a series. Yet both sorts of writing share a comparable array of techniques, including their use of intervals. The long poems place more emphasis on movement through space and on the quality of witness—“Solo,” on one level, is about a solo journey by car cross-country—but alongside the ‘artifacts’ they suggest that these two ways of envisioning the poem spring from the same gestures. N.B. Mark Weiss co-edited Across the Line / Al otro lado: The Poetry of Baja California (2002), reviewed here, and also edited The Whole Island: Six Decades of Cuban Poetry (2009), selections from which can be found here.